This is an interview with Jon Greuel, who was trained as a pilot and flew AWACS (Airborne Warning and Control System) for 20 years. During his 2008-09 deployment to Kirkuk, Iraq, as a Combat Air Advisor, teaching Iraqis how to fly, he completed the yoga and combat stress study during his off-duty hours (published in The American Journal of Occupational Therapy, January 2012). 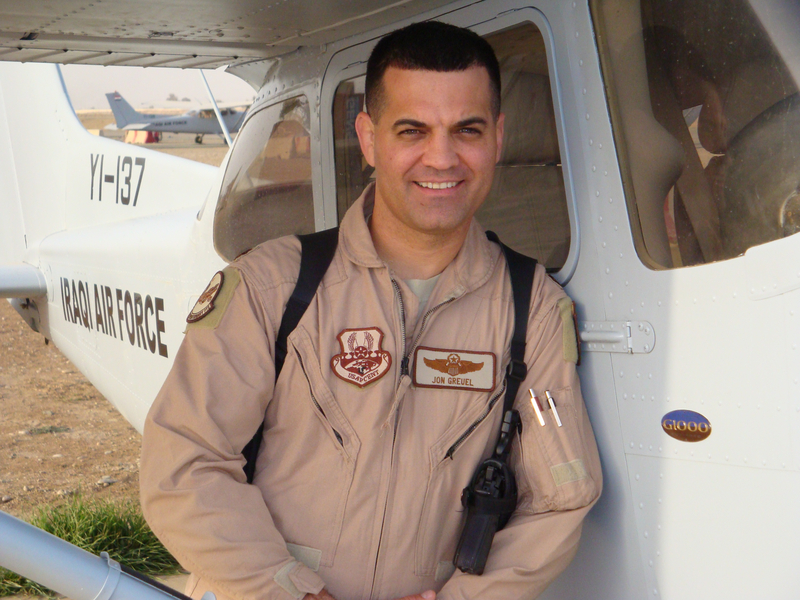 Jon retired from the Air Force in 2012 and completed a Professional Certificate in Mindfulness Studies from Lesley University while his wife, Suzie Verdin, completed a Master of Education at Harvard. Together they founded Humanity Moves in 2013, a Dallas-based nonprofit organization bringing movement education practices to underserved populations in partnership with various social justice minded organizations. Rob: How did your yoga and meditation practice prepare you for your deployment to Iraq? I was looking forward to a year of flying and teaching yoga, but at the same time I was missing my family and facing the unknown. My yoga practice enabled me to feel calm in my body, which countered the deployment stress. Observing these effects in others as well sparked my desire to document them, and to become an advocate for the use of these practices to counter combat stress and PTSD. Why do you think they should be part of basic training? It is a disservice not to equip new recruits with the skills and knowledge necessary to understand the changes their bodies and minds undergo during times of chronic fight-or-flight responses that are typical of combat deployments. Beyond a simple understanding, yoga and mindfulness training give people control over how they deal with hyperarousal. And just as importantly, they give people a new vocabulary for talking about the breath, movement patterns, and body awareness, in terms that are now quite scientific. The longer someone practices these mind-body practices, the more effective he or she becomes at self-regulation. Yoga and mindfulness practices are proactive combat stress management. What specific ways have you seen yoga and meditation useful for the treatment of PTSD? First, regaining the ability to sleep is swiftly restored with yoga. Second, restoring a felt sense of the here and now, informed through the body. Rather than being stuck in the past with the trauma, yoga is a practice in being present with the postures repeatedly filling our mind and body with the here and now. Third, people regain control over anxiety and a sense of confidence in their own ability to manage their PTSD symptoms that may have previously seemed beyond their control. Fourth, these practices restore decision-making power lost from trauma-induced learned helplessness. With each posture and breath begins a dialogue with our bodies that may have been necessarily disconnected in an effort to survive. In listening to their bodies, veterans become their own boss in that it is entirely up to them how much or little they participate. How can yoga become a game-changer in preventing PTSD among veterans? First, it can transform those already living with PTSD by putting them back in control of their symptoms. Our study showed it is practical to have a yoga program in a combat zone and that it reduces anxiety, perhaps making it the best non-pharmaceutical, evidence-based intervention for combat stress and PTSD. As more people are helped by these practices, their voices may begin to enlighten policy makers. But waiting for these voices to become loud enough to effect change on a scale to match the PTSD tsunami, is a failure of imagination and leadership. This brings us to the second game-changer, which would be a cultural overhaul within the military and VA systems to embrace mind-body practices for stress reduction. What is the greatest challenge we face in bringing yoga to veterans and active duty service members? The idea that mindfulness and slowing down has no place in our military. Many leaders are thoughtful and pragmatic, but unfamiliar with mind-body practices. We need our leaders to support these embodied experiences in order to direct the necessary changes. Asking authority figures to experience their own practice may be seen as risky, professionally and culturally. Is "head sheds versus body shops" a false choice? "We need more research before we can implement any programs." While we research, we need implementation at the same time. We need to make time for practice, for military members to engage in mindful movement on their mats, without fear of cultural or professional fallout. What counts right now is how many instructors are in front of military personnel leading them through these practices. "I'm not sure my troops will do yoga." You'll hear this when military leaders don't really want to do something. Citing military culture or their troops' unwillingness is a means to resist change or mask discomfort. Very little military training is optional and much of the training and culture is about adapting. Small programs, Big News! Journalists often report that the Army or VA is using yoga for PTSD. When you look more carefully, the programs are usually started by folks like me, mid-level workers who take the initiative despite the system, often having to convince skeptical superiors. When we see the Joint Chiefs doing yoga, then we may be seeing some real progress. Do you have any recommendations to address this challenge? Progress is already starting from the bottom up, but it is actually required from the top down to meet the challenges. Therefore, policy makers and administrators should be sent to trainings that familiarize them with yoga and mindfulness practices so that they may make more informed decisions, or at least not actively stand in the way. Start yoga training in boot camp, and make it a core component of every unit fitness program. We could pay military members who are already yoga instructors, and set it up exactly like the foreign language incentive pay. Deployed military personnel who can teach yoga during their off-duty hours removes the logistical barriers involved with deploying civilian yoga instructors. If a military member is an RYT, then put them through a [trauma-informed yoga] program and give them incentive pay. It'll save money in health-care costs. Every unit that deploys or every deployed location should have someone teaching yoga and meditation. Military personnel and veterans should be able to use Tuition Assistance and GI Bill resources for Registered Yoga Teacher (RYT) and Mindfulness-Based Stress Reduction (MBSR) certifications. Every Wounded Warrior Brigade, base, post, VA hospital, etc., should have both a therapeutic yoga and mindfulness program. What advice would you give to a fellow veteran teaching yoga at a VA hospital facility? If someone has established a therapeutic yoga or mindfulness class in a VA or military facility, he or she has likely overcome many of the challenges I've discussed. We need to hear from those veterans who are benefitting from these practices. This can be done through interviews, articles, surveys, and perhaps even going through the IRB process for a study. That is what we did in Iraq; it wasn't easy, but I like to think it made a difference. Stay connected with the Give Back Yoga Foundation as we share the gift of yoga with the world, one person at a time, by following us on Facebook, Twitter and Google+, or by subscribing to our newsletter. Are you a veteran or active duty service member? Visit our Resources for Veterans page to learn how you can request free yoga and meditation resources designed to alleviate the symptoms of post-traumatic stress.